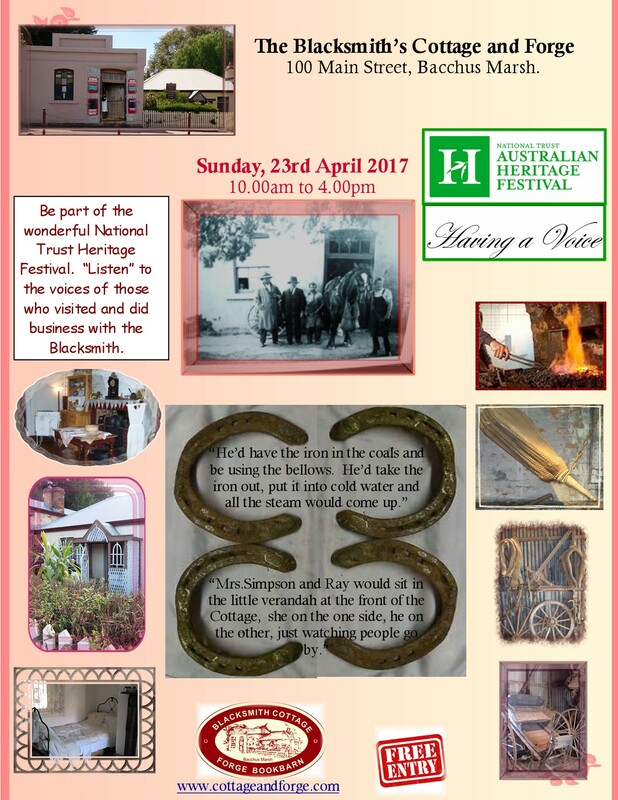 Heritage Festival, 23 April 2017 . Once again, we are part of the Australian Heritage Festival. Come and visit the Blacksmith’s Cottage and Forge – step back into the past when the ‘smithy was a going concern and the ‘smithy’s family lived in the adjoining Cottage. In 2009 our Committee undertook an Oral History project, recording the voices of some of the district’s farming pioneers of the early 20th century, when the horse was the main source of transport and power and the Forge, the hub of the community. During your visit you will hear their voices. Watch a video of the ‘Marsh’s earlier days. Volunteers will take you through the Cottage and Forge and tell you some of the stories from the past. The experience will take you back into the days before modern technology, when water had to be fetched from the well and everything you ate, used or wore had to be made by hand. Come and share some of these memories with us and revive your respect for those early pioneers who paved the way.